What does it take to become a serious gamer? Conan: A lot of dedication. Not just playing casually, or for fun, but you have to focus on areas you can improve on. There are a lot of resources online, including videos of some professional players. One good way is to play a game and watch the replay, taking notes on ways to improve your strategy. It’s almost an academic way of gaming. Are there any skills in competitive gaming that you would say are applicable outside of the gaming environment? Conan: (Laughs) There is a study linking surgeons to their video gaming abilities, but in terms of realistic applications, gaming involves a lot of problem solving. At least in Starcraft, there’s a lot of strategy and on-the-spot critical thinking that requires you to think very quickly in reacting to your opponent. How do students get on the Berkeley StarCraft team? How else can they get involved? Conan: Everybody can join. But only the top people compete with other schools, obviously. We had an in-house tournament to determine our top seven starters and substitutes. For DotA, I think they did the same thing, and looked at competitors ladder ranking. MLG (Major League Gaming) is always looking for volunteers and they events that feature ways of getting involved. Texas has a very large association called TESPA ( Texas eSports Association), and hopefully we’ll have something similar here. How do these competitions run? Conan: They seed based on past tournaments and then have 256-man open brackets that are difficult to enter due to high demand. If you qualify on that, you enter pool play and it’s a standard tournament from then. Conan: $40,000 for first place. This is the first year it’s been that much – it was $5,000 last year and then they got a big sponsorship. What is it about Berkeley that makes our team one of the best? Conan: Aside from the obvious answer: ‘Asians,’ Berkeley has a history of E-Sports. We ran a StarCraft decal – the first StarCraft class ever. I knew the instructor: Alan Feng. He was really interested in math, so he placed a math-based emphasis on StarCraft. He would use equations and proofs to demonstrate effective strategy and he would ask his students to calculate the mathematics behind tactics like flanking. There are a few players who have lifetime bans from collegiate StarLeague. What does it take to receive a lifetime ban? Conan: We have this term in StarCraft: bad manners. If you’re excessively rude, or you make a lot of racist remarks, they’ll ban you. It’s kind of like the sportsmanship you would expect out of athletes in a lot of other collegiate sports. Who is your personal favorite gamer, and why? Conan: In terms of play there’s a transgender male to female player: Scarlett. She’s really, really good. She won the entire Canadian and North American tournament. Where do you see E-Sports in the next ten years? Conan: It’s definitely growing a lot, it’s getting more and more mainstream. One of the things I’m hoping is that colleges will come to sponsor their own E-Sports teams. 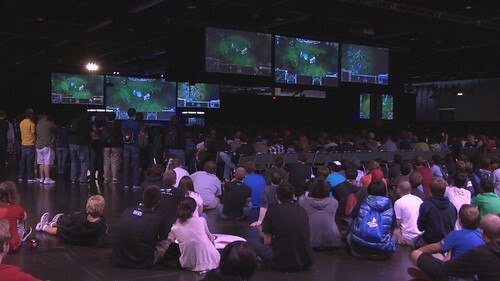 I would love to see E-Sports as something alongside baseball or basketball. I know it sounds unlikely to happen, but as there are more and more fans, League of Legends and DotA are holding million dollar tournaments; it’s getting big. Who is our toughest competition and are we going to beat them? Conan: For DotA we faced off against UCSF, and they were very tough but we barely beat them 3-2. And they’re grad students, so we were surprised that they were really good. For StarCraft, we’ve narrowed it down to a few teams: one from Korea, one from Europe and another team from North America: University of Washington. Generally, you would think the Korean team would be the strongest, but it was the first season Korea joined this tournament, so not a lot of schools from Korea were represented. The Korean team isn’t as scary as you would think, but they’re obviously a threat for making it this far. I would say our biggest threat is University of Washington. They took us out last year in the round of 16, and they have a lot of strong players. Hopefully we can get revenge this time. As Conan and the rest of the StarCraft team prepare to face off against their international CSL competition, we wish them the best of luck in representing Cal. Whether they win or lose, one thing is clear: E-Sports at Berkeley is flourishing.